The Fraser River is set once again to become entwined with Vancouver’s story. As the city grows, it is rediscovering the delights of its southeastern waterfront. Formerly known as East Fraserlands, this new community is rooted in a rich history that helped create our modern city. Now ParkLane Homes is reconnecting Vancouverites with their city’s last great waterfront experience – its name is River District Vancouver. 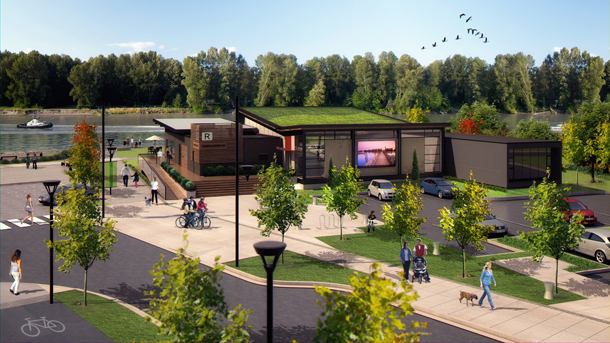 River District Centre is an innovative space that will be open to everyone, located at the foot of the hill where Kerr Street meets the river. The Centre’s green roof is one of its many sustainable design features. The Centre will offer visitors information on the vision and development plans for River District. It contains state-of-the-art interactive displays and a large scale model of the community plan. It also features a Kid Zone where children of all ages can play games and learn about wildlife in the area. The Centre will also offer programs and services to the neighbourhood. River District will be partnering with local community groups to offer regular programming for children, teens and seniors, as well as special events that the whole family can enjoy. River District is changing the way people experience the waterfront. You can now run, bike, play ball, picnic or walk your dog on trails and parkland by the water’s edge. Public areas have been restored, with new street furniture, lamps and other amenities welcoming visitors and local people back to the community. Experience nature, the waterfront, a new restaurant and a new sense of community here�”all without leaving Vancouver. Everyone knows that Vancouver is a great place to live. The plans for River District will make the dream come true for more people, with affordable homes in a rooted community. The Community Plan is all about bringing the good things in life within easy reach of ordinary homeowners�”like walking to school, playing ball in the park, cycling the trails, family meals at a local restaurant. River District is very much a part of Vancouver, connected to the larger life of the city. The planning process has been highly collaborative, as we work to build a new community that works for everyone who will live here. From toddler to grandparent, everyone is equally important. River District’s location has always attracted people since the days of the First Nations. The reasons for being here may have changed, but the memories of those former times will be celebrated in River District’s new neighbourhoods. There will be five neighbourhoods in three distinct zones: west, central and east. In the west, Hill Point will sits perched on the north side of the property with wonderful views of the Fraser. The homes here will be townhomes and low-rise condominiums, set in small blocks around intimate gardens. South of that, fronting the river, will be Pier Point, an idyllic reminder of its close connection with the water. Family homes will again be condominium apartments with easy access to tree-lined trails by the water. In the centre, Mill Bay will be the thriving hub of the new community, with commercial spaces and retail stores mixed with high-rise homes and townhouses leading down to the bay that bears its name. Here the crane reminds us of the history of the Canadian White Pine Mill. Above Mill Bay is The Crescent, so called for its distinctive street shape, providing easy and convenient access to and from the community. To the east is Avalon, named for the extensive park that bears that name. The area has a great expanse of public greenspace for sport and recreation. Here, homes will be multi-family, many with excellent elevated views over the river towards Mount Baker. River District is bounded by the Fraser to the south and the rest of Vancouver to the north, so it needs to act like a city that’s not in the city. 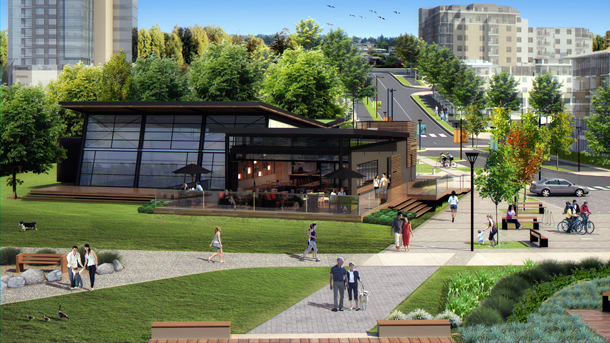 Over 25 acres of the 130-acre site is devoted to public space, part of a sustainable plan that has a long-term vision. Designed by a world-class team of planners, architects and engineers, this will be a thoughtful modern solution, a new way to live and work in Vancouver. It’s nice that the kids will have a chance to learn about it since once this area is developed most of the wildlife will be gone gone gone.